For the cake: Preheat the oven to 325°F. Cover a cake mold in cooking spray. Set aside. Mix the flour, baking soda, apple spices and salt in a medium bowl. Set aside. Combine the butter and sugar with a hand mixer at medium speed until creamy, 3-4 minutes. Add the eggs, one at a time, and mix well before adding the next. Add the applesauce and yogurt, and mix well. Reduce the speed to low and add the flour little by little, keep mixing until well combined. Add the apples and use a spatula to incorporate them in a folding motion. Pour the mixture into the previously prepared mold. Bake for 50-60 minutes or until a toothpick comes out clean when inserted in the middle. The cooking times will vary depending on your oven and the type of apples you use, so check on the cake frequently. If you see it browning too quickly, but it’s still not ready, place a piece of aluminum foil after the first 40 minutes to prevent it from continuing to brown. Let it cool completely before removing from the mold. For the glaze: Melt the sugar with the butter and salt in a medium pot over medium heat, stirring occasionally. Let boil and add the cajeta, milk, corn syrup and vanilla. Boil for 3 minutes, stirring occasionally. Add the powdered sugar and stir until there are no lumps. Cover the cake with the frosting and serve. Keep left over frosting in a sealed container in the fridge. You can use it on pancakes, waffles or chopped fruits. A few days ago we took the kids to a local apple orchard. It was a fun experience, but we ended up with a ridiculous amount of apples. Not wanting to let them go bad, I decided to get creative. I've already prepared homemade applesauce, apple rings and roasted apples, to name a few. This apple cake was one of the favorites. 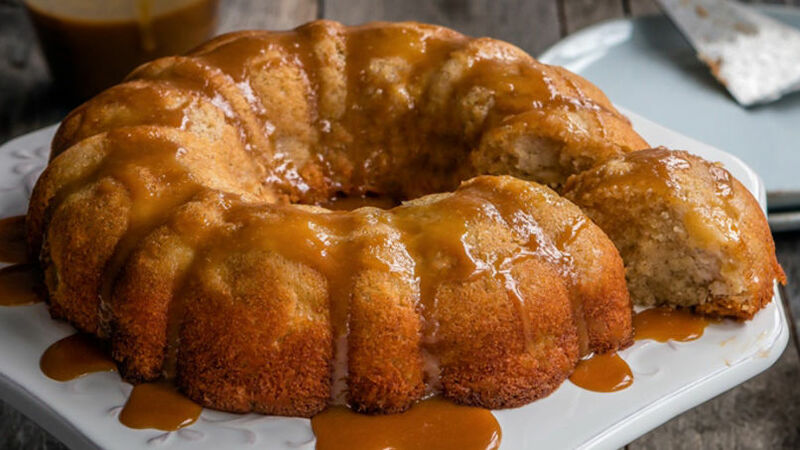 It's a very moist cake due to the apples that release a lot of liquid when cooked, perfect when served with coffee or tea. Enjoy!